ARCADIA, CA—Brandywine Home has purchased an .82-acre land plot in Arcadia with plans to develop 17 three-story for-sale townhomes. The project will bring for-sale housing options and opportunities to an area with extremely high demand for housing. The project is scheduled to break ground in April 2015 and the houses will come to market in December 2015. What little rain we’ve had this winter has done nothing to alleviate our multi-year drought. However, buying a new Orange County home helps because you’re automatically getting the latest water-saving appliances and plumbing technology. If you’re still concerned about our growing lack of this precious liquid, and who isn’t, you can take further steps to minimize water use as described by the Yorba Linda Water District. The agency also details statistics on how much you actually save with each recommendation, so you can choose the most effective ones to try. · Clear your driveway with a broom instead of a hose. This saves 21 gallons each time. · Rather than a lawn or water-hungry flowers for your front and back yard, install native Southern California plants that require little to no watering. You’ll save 120 gallons per day for every thousand square feet of turf that you do not use. Another no-water option is to used hardscaping, such as a brick patio. · Run your washer only when it has a full load. You’ll save from 15 to 40 gallons per wash, which totals 105 to 280 gallons a week, assuming you wash every day. · Reduce your shower time and stop running the sink faucet when you brush your teeth, shave, or wash your hands. You’ll save about five gallons per minute. Eliminating about five minutes of water use saves 25 gallons each time. · Never wash dishes by hand because you use up 5 gallons a minute. It actually saves water if you rely on your dishwasher for this chore, especially if you run the machine only when it’s full. If you want to know what else you can do in your new house to save water, or want to buy a home, please contact us. Brandywine Homes has closed on a 0.82-acre site at 136 Las Tunas Drive in Arcadia and plans to build 17 three-story contemporary townhomes in an area desperate for more housing. Groundbreaking for the community, called Griffin, is planned for April 2015, and construction is expected to be complete in December 2015. Brandywine plans to build 17 three-story two-, three- and four-bedroom townhomes ranging in size from 1,265 to 2,205 square feet. 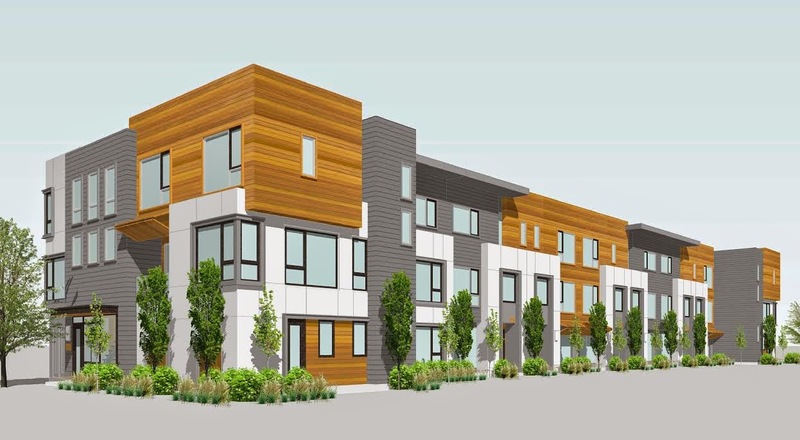 Most townhomes will have full side-by-side garages, and all will have contemporary architecture, stainless steel appliances and solid-surface counters. Residents of the new community, located between El Monte Avenue and South Santa Anita Avenue, will have access to Arcadia’s excellent schools and will be 3.3 miles away from the 210 Freeway, making commuting easy. Griffin is close to Santa Anita Park, Westfield Santa Anta shopping center, the Santa Anita Golf Course and downtown Pasadena. According to the National Association of Home Builders’ formula to determine the local impact of single-family housing in typical metro areas, adding 17 single-family homes will generate $3.6 million in local income, $374,000 in taxes and other revenue for local governments and 55 local jobs. Brandywine Homes has closed on a .82-acre site at 136 Las Tunas Drive in Arcadia, with plans to build 178 three-story contemporary townhomes. Groundbreaking for the community, dubbed Griffin, is scheduled to break ground in April 2015, with delivery expected by December 2015. ARCADIA, Calif. – January 20, 2015 – Brandywine Homes has closed on a 0.82-acre site at 136 Las Tunas Drive in Arcadia and plans to build 17 three-story contemporary townhomes in an area desperate for more housing. Groundbreaking for the community, called Griffin, is planned for April 2015, and construction is expected to be complete in December 2015. Brandywine plans to build 17 three-story two-,three- and four-bedroom townhomes ranging in size from 1,265 to 2,205 square feet. Most townhomes will have full side-by-side garages, and all will have contemporary architecture, stainless steel appliances and solid-surface counters. ARCADIA, CA – Brandywine Homes has closed on a 0.82-acre site at 136 Las Tunas Drive in Arcadia and plans to build 17 three-story contemporary townhomes in an area desperate for more housing. Groundbreaking for the community, called Griffin, is planned for April 2015, and construction is expected to be complete in December 2015. About Brandywine Homes: Brandywine Homes is a residential homebuilder based in Irvine, Calif., that specializes in challenging infill development. Founded in 1994, the family-owned and operated company has built or developed almost 1,500 homes in 45 small- and mid-sized infill communities, revitalizing some of Southern California’s oldest and most established neighborhoods. Brandywine builds homes that respect and complement the heritage, values and architectural integrity of existing neighborhoods and the people who live there – making a positive contribution to the community. www.brandywine-homes.com. Social media: Facebook, Twitter, LinkedIn and Brandywine Blog. ARCADIA, CA–(Marketwired – Jan 20, 2015) –Brandywine Homes has closed on a 0.82-acre site at 136 Las Tunas Drive in Arcadia and plans to build 17 three-story contemporary townhomes in an area desperate for more housing. Groundbreaking for the community, called Griffin, is planned for April 2015, and construction is expected to be complete in December 2015. ARCADIA, CA-(Jan 20, 2015) –Brandywine Homes has closed on a 0.82-acre site at 136 Las Tunas Drive in Arcadia and plans to build 17 three-story contemporary townhomes in an area desperate for more housing. Groundbreaking for the community, called Griffin, is planned for April 2015, and construction is expected to be complete in December 2015. ARCADIA, CA– (Jan 20, 2015) –Brandywine Homes has closed on a 0.82-acre site at 136 Las Tunas Drive in Arcadia and plans to build 17 three-story contemporary townhomes in an area desperate for more housing. Groundbreaking for the community, called Griffin, is planned for April 2015, and construction is expected to be complete in December 2015. Direction. Sometimes, you like it when the sunlight’s streaming in. But on other days, it might not feel so good to have it streaming in while you’re trying to sleep in. If your bedroom faces east, chances are you will be woken up by the sun. This is just something you might want to consider when looking at new homes. Bathtubs. If you like to luxuriate in a large tub once a week or more, you might want to make sure that the bathrooms in your new home are conducive to this. If the bathtubs are too small or there’s just a shower in some of the bathrooms, you won’t be able to avail yourself of this small luxury. Attached Bathrooms. Most homes will have one attached bathroom in the master bedroom but the rest of the rooms may not have this convenience. However, if you have one boy and one girl, you might need to have separate bathrooms for them, for privacy’s sake. Also, if you have any elderly relatives you’re taking care of, they might need attached bathrooms if they need to go in the middle of the night. So look out for this feature in your new home. Closet Size. If you like buying clothes, shoes and accessories, it’s possible that the closets provided by the builder may not be big enough for you. You can check out closet size and see if there’s a small extra room that you can convert into a walk-in closet. View. If you don’t like the lack of a view in your old home, you might want to buy a home with a good view this time around. A good view can really change the entire feel of a home. As soon as you come home, you can open the windows or draw the curtains and take in the vista before you. Contact us for more ways to figure out if a home for sale is right for you.